Medium format film cameras are my favorite cameras to use. I can't pinpoint a specific logical reason for this, but I can tell you emotionally there are quite a few benefits for me. Patience: With the exception of one camera below, these cameras force you to slow down compared to 35mm cameras of the same vintage. You are framing moments and posing. There is no spray and pray here. Abnormal shooting experience: They are big and demand attention. You have unique choices in viewfinder types with some. 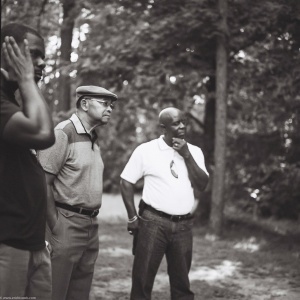 There is nothing normal about the experience of shooting with most medium format cameras. Extraordinary results: When you get the image right there are no words. Nothing like it with any other film or digital format I have used. Price: Yes, you have to pay for film and developing (if you are like me and have not taken the darkroom plunge yet), but the difference in price between digital and film is staggering. 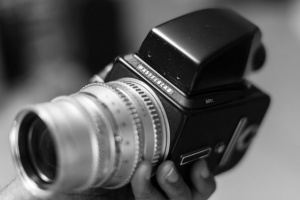 Many digital medium format cameras cost, like used and some new cars. While film variants top out in the low four digits with most on this list available for the low end of three figures. Arguably film is superior to digital: To my knowledge there is no true medium format sized sensor as compared to film. 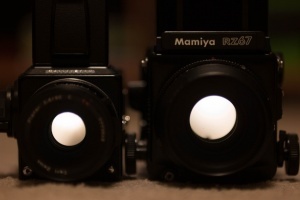 Since surface area is the main point of medium format cameras this matters. Throughout this post I will share a high-level overview for anyone from novice on up who has thought of, but has not yet plunked down hard earned cash on a medium format film camera. The post is not an attempt to tell anyone what camera to buy or even if they should buy a camera. Read on and choose accordingly for yourself. There are many cameras beyond these listed in this post, but a good cross section of format size, functionality and camera type ranging from SLR handling to rangefinder to classic waist level viewfinder are represented here. I always wanted a medium format film camera! 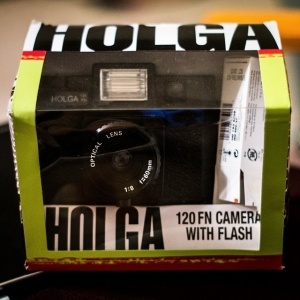 Technically, my first 120 film camera was a Holga I bought on a whim, but I have yet to take one shot with it after purchasing it, loading it with film and returning it to its box. I am glad I have it since they have discontinued it. Finishing the roll is on my to-do list. 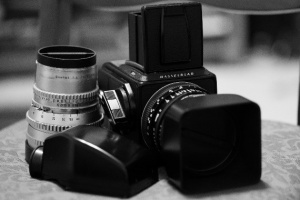 Based on one brand, Hasselblad, I thought real film medium format cameras were out of reach price wise. One day, by way of a kind friend and good fortune, a mint condition Hasselblad along with vintage accessories fell into my lap. After one roll of film I immediately understood why so many love medium format cameras. One shot from my first roll of 120 film sealed the deal. Dad and other men folk at the family homestead in Warrenton. This is the point where I began to fully grasp what that larger negative could provide. The clarity and almost otherworldly subject isolation was an immediate photography dopamine hit. Then sentimentality stepped in as one of my children attached themselves to the Hasselblad. This led to the two medium format cameras listed below (stay tuned for part 2 where I will share my thoughts on two more) in the order I acquired them. I will note why I bought them, along with pros and cons of each with sample photographs. In conclusion, I will share my personal preferences. Each having different aspect ratios is no accident. Part of what intrigues me about 120 film is that the same film roll can produce different size negatives. 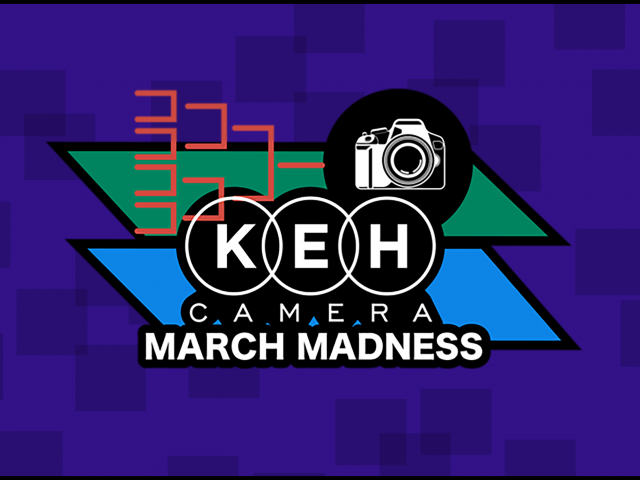 I intentionally chose cameras with 6X6, 6X7, 645 and 6X9 formats. A small, but diverse grouping. Other than using 120 film the only common trait for all listed is manual focus. First up the Hasselblad 501c. Medium format genesis for me. Almost meditative in its operation. From loading the film to shooting with it to the unloading every step is intentional and satisfying. After searching online for one and initially making peace with the fact that I could not afford a Hasselblad, this one literally fell in my lap. A beyond reasonable price from a friend made this an offer I simply could not refuse! It came with a Sekonic light meter, an 80mm f/2.8 lens, waist level viewfinder and one 120 film back. I added a 150mm f/4 lens and a non-metered eye level viewfinder. Bought both at bargain class from KEH and in great shape. The lens had a bit of patina that I like, but the glass was completely clean. The viewfinder had the tiniest dimple in the top, but paint was clean and it functions perfectly. Both were a terrific price! Cons listed throughout this post are as compared to the other cameras on this list. All manual with no internal metering, but that comes with an advantage that I will note in the "What's special?" section below. I thought it was large and brick like, but a camera further down makes this out to be a compact camera. It is a photography icon if inanimate objects can be described as such. If I close my eyes and someone says, “camera” this is what will come to mind. People who know nothing about cameras will know what a Hasselblad is. The large bright ground glass showing the scene to be captured is captivating. Above, I mentioned all manual as a con, but the huge advantage associated with this is that this is a machine that does not require a single battery to operate. 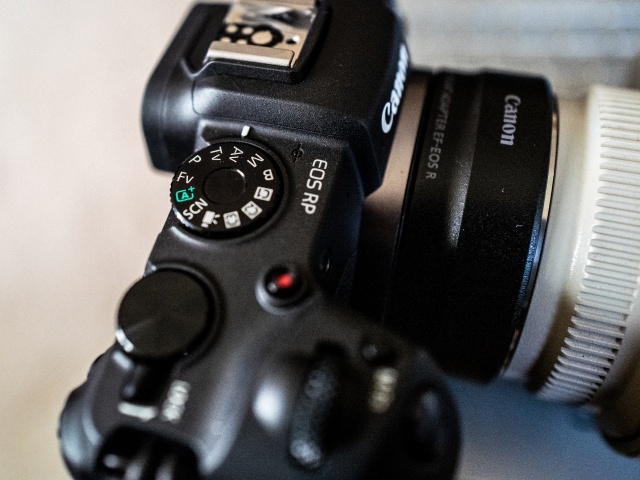 Wonderfully (over) engineered: For example, to keep you from accidentally exposing your film by removing the film back once you remove the dark slide the button to remove the film back is deactivated. If I lost you on any of that peruse some Hasselblad YouTube tutorials and they will bring you up to speed the same way I was when I got lost from time to time. Fully modular: The lens, viewfinder and film back can all be swapped out on this model. Some others even allow you to switch out other parts like the winder knob. I have limited myself to the kit outlined here, but the options seem endless. The swappable film back allows you to switch out film mid roll. Say if you wanted to switch back and forth between color and B&W or different speed film you could do that without losing a single frame. Classic 6X6 exposure yields a relatively high 12 exposures per one roll of 120 film. 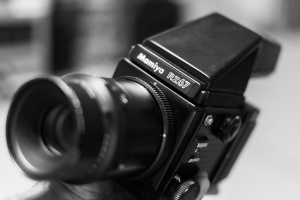 Second up the Mamiya RZ67. This camera just looks beautiful to me! 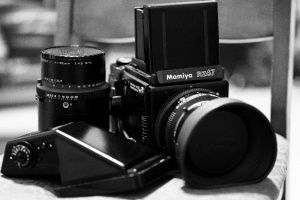 Not as classic as the Hasselblad, but a handsome set up. Southeastern Camera, Carrboro. It sat in the floor for months taunting me until I finally rescued it. It came with 2 lenses (normal and portrait), waist level viewfinder, one 120 film back, and a critical focus magnifier adapter to be used with a metered eye level viewfinder not included. The metered eye level viewfinder not included. Again, from KEH. Due to the larger negative you get less shots from a 120 film roll. 10 as opposed to 12 from the Hasselblad. Compared to the others size and weight. If the Hasselblad is a brick this is a cinder block. Objects in the above photo are larger than they appear. This camera dwarfs the others. I brought the RZ67 out to Duke Gardens on a warm day once and left with blown out armpits and a cramped left hand. It took great shots though. The weight and size also make neck straps rather awkward. Like wearing a small boat anchor around your neck and square body does not rest easily against one’s torso. Since then a monopod is a must if I am going to be mobile for a while. This camera does not play well with others in camera bags. Two lenses, and the viewfinder have their own dedicated backpack. Nothing else will fit, not even my smallest 35mm film camera. Bellows focusing (con): Lens glass is fixed and instead of shuffling lens elements the whole front face of the camera slides back and forth to focus. With a long lens this can shift weight forward a good deal when focusing on closer objects. 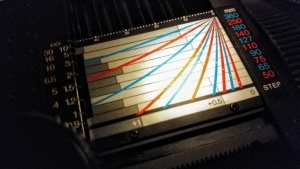 When extending the bellows available light reaching the negative is impacted which needs to be considered when exposing manually. A handy dandy scale is provided next to the bellows that causes me to glaze over if I stare at it. Rotating film back (con): The main reason this camera is so large is that the film back rotates between portrait and landscape. This has benefits that I will list below, but this also necessitates that the body be built like a 7x7 camera to handle both orientations. Even larger and brighter ground glass showing the scene than the Hasselblad. This is similar to looking at a small TV in the waist level viewfinder. 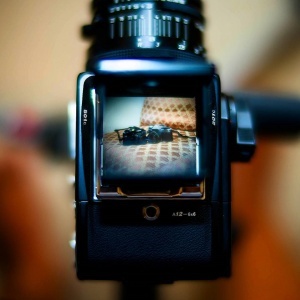 6x7 aspect ratio is preferred by many over the Hasselblad's 6x6 and is more conventional for printing and framing. Size and weight does have its benefits. People cut a swath for you to pass when you come through with this beast on a monopod. 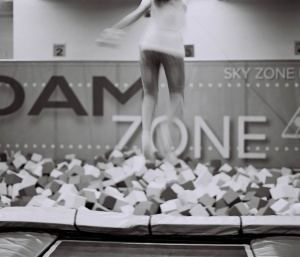 Some literally ducked for cover at an indoor trampoline park. Bellows focusing (pro): Makes near any lens a macro lens. Rotating film back (pro): It is great to be able to change between landscape and portrait with a flick of the wrist. 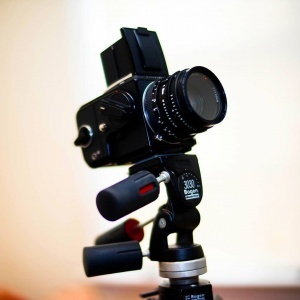 Especially useful when mounted to a tripod. Also, fully modular. The lens, viewfinder and film back can all be swapped out. The swappable film back allows you to switch out film mid roll. This next and last point has a lot to do with personal taste. Since film is the sensor, my internal objective logic says that the IQ should not change that much between cameras, but my inner subjective self tells logic to shut all the way up when I see the photos that this camera produces. I cannot pinpoint what it is about the pictures, but this camera produces images that are 'special'. The color rendering. 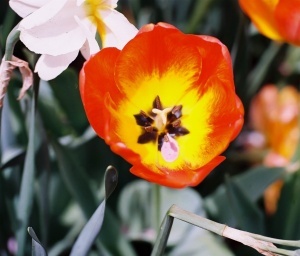 The sharpness without being too sharp... Maybe 6x7 is just a sweet spot? I don't know, but check out the sample images below. Next up will be part two where I share my thoughts on the Pentax 645 and Fujica GW690. Two cameras, not only quite different from the 2 listed above, but also very different from one another. Stay tuned!